Hiking, Backpacking, Paddling, Camping, and Exploring Pennsylvania's Endless Mountains…and beyond. The chilly morning revealed feathery clouds sailing across a deep blue sky. By the time Wes and I reached the trail, the deep cobalt skies were free of clouds, providing a vivid contrast to the snow that covered the forest floor and streams. We returned to SGL 57 to explore one of its hidden treasures, Catlin Brook, its falls and ice flows. Catlin Brook is a small stream that careens high off the plateau down a precipitous glen guarded by cliffs and ledges. The falls and cascades are almost non-stop. Our hope was to see Catlin’s tremendous ice flows before the spring thaw. We would not be disappointed. However, Catlin does not reveal its beauty easily. While we did find a closer access, the snow prevented parking. So we had to do the long 7 mile hike in from Stony Brook. Our hike crossed frozen Stony Brook as the bare plateaus rose around us. 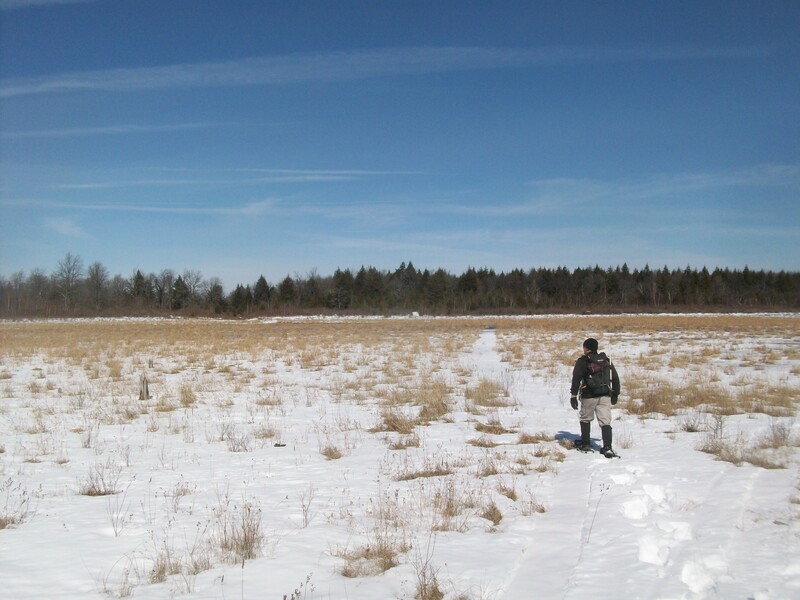 Our snowshoes were a help, but we still sank in the sun-softened snow. I fell on my face twice where my snowshoes caught hidden branches, and crossing flood-torn Red Brook required some delicate balancing. We pushed up to one of my favorite spots where the trail tunnels under spruce to reach the Crystal Cascade, a place where the creek tumbles over a series of boulders into a pool. While it is not high by any means, the cascades are serene and isolated in a beautiful setting, shaded by spruce and hemlock with carpets of moss. Today, it was frozen with ice and snow. The trail continued up the drainage, passing spruce trees and small streams. We turned right onto an old mountain bike trail that follows a stream. I’ve always enjoyed hiking this trail as it threads its way between forests of hemlock and spruce while offering views of the creek below. Huge black cherry trees towered over the forest. As we climbed higher, the snow was deeper, reaching over a foot deep. The bright sun made us feel warm and we were losing energy. I had to remind myself to drink water to keep hydrated. Then, as if it were a gift from heaven, we found some snowmobile tracks on an old forest road. We sailed across the packed snow as we hiked towards the Catlin Meadows. Cliffs and ledges rose through the woods to our left. The meadows were an impressive sight under a deep blue sky as cirrus clouds curved across the atmosphere. The wind blew constantly. The feeling of isolation was absolute, with no noises from towns or highways. The meadows had some water and the sun shined across the ice and snow, casting a metallic glare. We found a deteriorating hunting blind that was collapsing in on itself. The trail then tunneled under incredible hemlock forests before we left the trail and descended to a meadow or frozen bog. We made our way through a spooky hemlock forest with an understory of bare branches. Ahead was Catlin Brook, murmuring under layers of ice. We decided to descend Catlin Brook all the way to the bottom, this would enable us to see all the ice flows and falls. We weren’t sure if there was then enough time to hike all the way back to the car, so we gave Ryan a call to shuttle us. We decided to hike out to the road and have Ryan pick us up. Sometimes a rare luxury while hiking is nice to have. We made our way down over snow covered ledges and frozen cascades. Soon, we were at the rim of the glen where the creek falls away. The western rim of the glen seemed a little less steep, so we picked our way down. My snowshoes were hard to control on these steep slopes, so I decided to take them off. Postholing in the deep snow with my feet would make the descent easier to manage. I had to step carefully, the snow was up to my thigh and I had to be careful I didn’t break a leg in a hidden branch. As we hiked down, pieces of snow and ice became dislodged and raced down across the snow into the deep glen below. We reached the bottom of the highest falls; it was a multi-tiered cascade about 100 feet tall and it was completely frozen over. The setting sun sent shafts of light through the trees. Below us was another falls and a partial view through the trees. Our descent continued, bypassing high cliffs until we reached a view of the incredible, glacial blue ice flows on the opposite side of the glen. The ice wall was about 80 feet high. Plumes and columns of ice descended from ledges and cliffs. Some were powdery white, others blue. The steep terrain was relentless as we switch-backed our way down. I walked around a ledge to see an incredible grotto of ice on both sides of the glen. Everything seemed encased in ice, dusted with snow. I wish we were able to climb up the creek to the base of the ice grotto, but it was inaccessible. The terrain became more moderate as the creek dropped over a series of cascades, culminating in two waterfalls. The rugged glen soared above us. 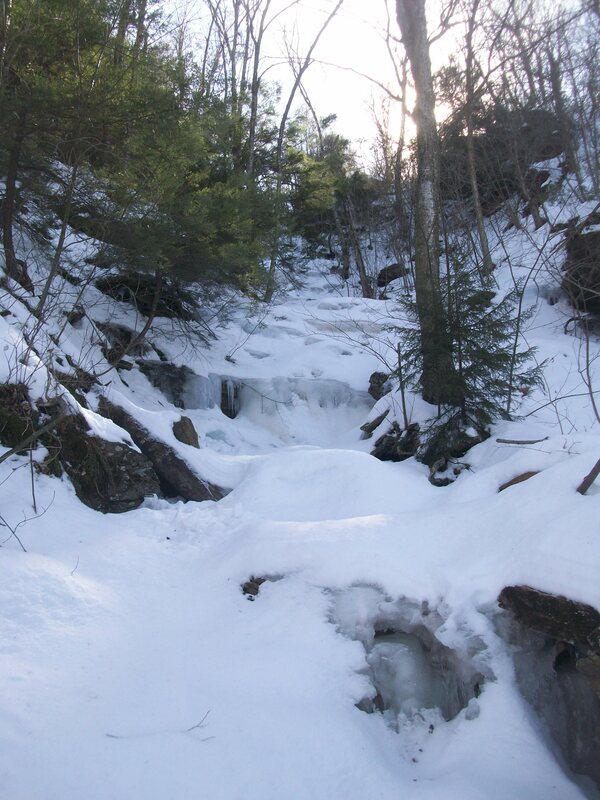 We hiked out of the glen and out to the road, happy to finally see Catlin Brook in its frozen splendor.